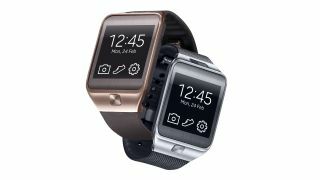 The Samsung Gear 2 is a surprising addition to the MWC 2014 party, not just because it's predecessor has been on sale for such a short amount of time but because it's been joined by a little brother: the Gear 2 Neo. It's also dropped the Galaxy part of its name for the update, presumably as the range is based on Tizen OS rather than Android. If you read our initial Galaxy Gear review, you'd see why Samsung has rebooted this so quickly. A smartwatch may be cool, but if it costs too much, has too short of a battery life and is filled with useless gimmicks, it's not going to sell well – and that's precisely what we found with Samsung's first effort. The Gear 2's got the same 512MB of RAM as the first iteration, but with a dual-core 1GHz processor, which is much needed over the original. So now we have the rebooted version, and it's likely to be tied in heavily with the Samsung Galaxy S5 – read on to find out all about the two new watches as Samsung battens down the hatches ahead of the iWatch release. When it comes to the new look of the Gear, it's pretty much business as usual. The screen is precisely the same (a 1.63-inch 320 x 320 Super AMOLED option) and the surround looks pretty similar to the original as well. We actually liked the design of the first Gear, as it combined industrial-looking materials with sleek lines – but combined with the camera it was just too large. Rumors it would be up to 20% thinner are unfounded – it's actually closer to 9% - so The Samsung Gear 2 doesn't deviate a huge amount from the first iteration, coming in with 36.9 x 58.4x 10.0 mm, and weighting 68g. That's not a lot different from the Gear 2 Neo, which clocks in at 37.9 x 58.8 x 10.0mm, but is 20% lighter at 55g, which will make a fairly big difference. It's not the major redesign we were hoping for, but at the same time, there are some tweaks we like: moving all the sensors onto the watch face means you can now change the straps rather than having to have the same lurid rubber option, which will appeal to those who want a genuine watch replacement. There's also a home button now, which will make it easier to navigate around the device when you just want to know the time. The two devices differ very little in actual fact – the main change is the dimensions listed above, with the Neo coming in a lot lighter than its better-specced brother. In terms of actually being better on the spec front, it's only the camera that's missing – both still have the all-new infra red blaster to control TVs and DVD players, but the same 1.9MP camera pervades on the Gear 2. Both are also dustproof and water resistant to IP67, which is pretty impressive given the last model could barely look at rain before deciding to curl up into a technoball and hibernate for the winter. We've heard loads about Tizen in the run up to MWC 2014, where Samsung is supposed to be showing off phones using the new operating system. But here's an interesting one: the new Gear range are running the OS as well. There are a number of reasons for this, but one that could have legs is it would make the watch a lot more enticing for developers. The reasons for the switch to Tizen are unclear, but Samsung is touting the fact that the OS will work widely with other devices, and TVs from the South Korean brand are tipped to switch to the OS soon too, which would make sense from a brand unity point of view.